Another gloomy day in North Carolina. Praying that the storms aren't severe today. I loved thunderstorms pre-children but now that I'm not a mom, I don't like them at all. I don't like when my girls get scared and can't sleep. So many things change when you become a parent and a love for thunderstorms is definitely one of them. 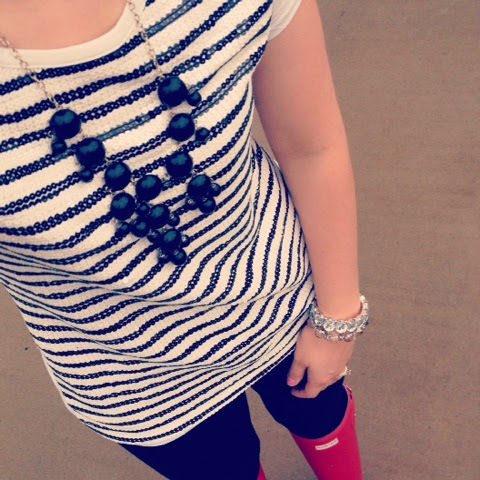 I'm wearing my Hunter rainboots on this rainy day. While I was walking to my car after taking Julianna to preschool, another mom stopped me to say, "I've never seen anyone look so cool in rainboots." Best compliment of the day. She made me smile and laugh a little, too. It's just the little things in life. A random comment by someone you don't know can't brighten up a gloomy day. I seriously have a neon attraction right now. 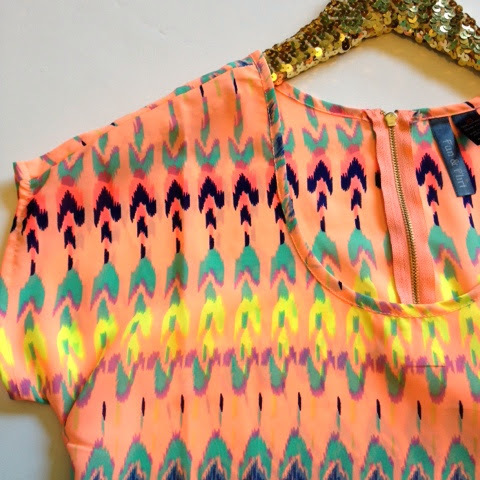 When I'm in a store, my eye is drawn to anything neon but especially neon pink. While I was in Old Navy yesterday, I immediately spotted this flower necklace when I walked by the jewelry section. I thought about it several times while walking around so I decided to go back and check the price. It was less than $5 so I grabbed it. 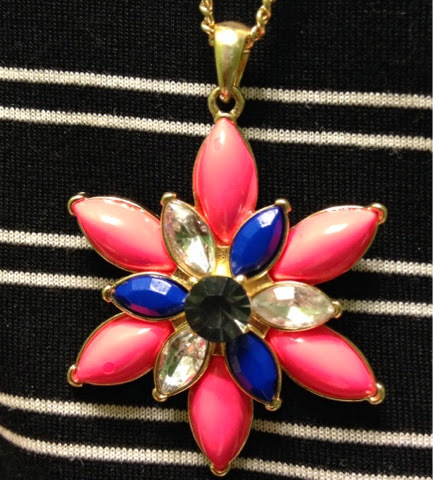 It's on a long chain which is different than most of my statement necklaces. I thought it brightened up today's gloomy weather. Hoping these upcoming storms aren't going to be as bad as predicted! 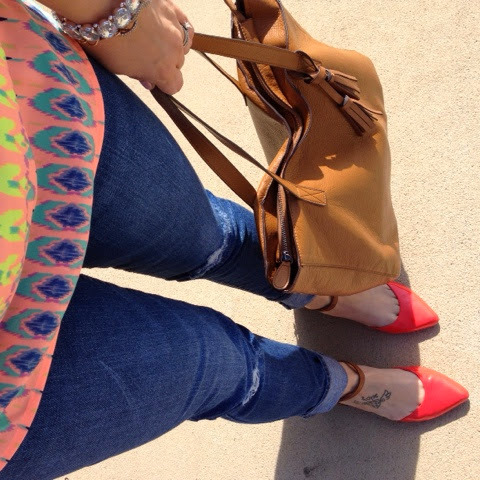 My love for neon colors continues to grow. I needed a new pair of tennis shoes for walking/running/chasing my girls. My other pair were just a little too big for me and it made them uncomfortable- especially when trying to do anything athletic. I found these neon pink New Balances at Marshalls last week. 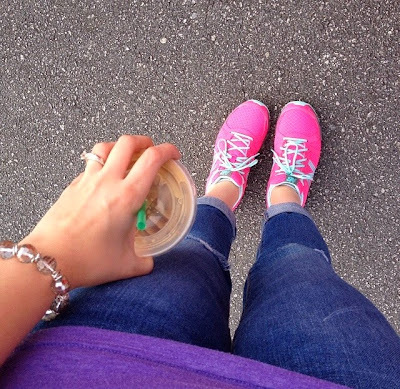 Neon pink with turquoise laces. I now have comfortable and cute tennis shoes for less than $40! Olivia and I ran a few errands while Julianna was at preschool this morning. Target for diapers and wipes and then Old Navy to use my Supercash. I had a coupon for $10 off a $25 purchase. So I got the shirt and shorts below for right at $15 dollars. How fun are those polka dot shorts?! 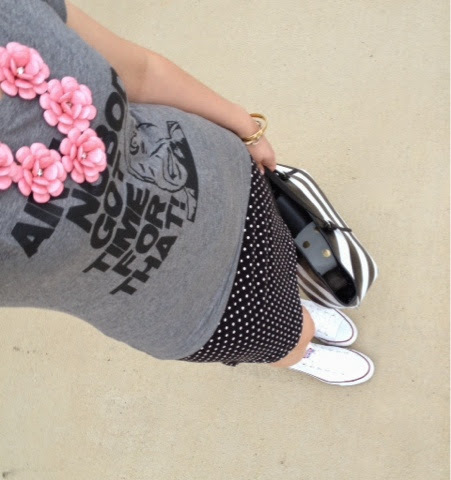 I love polka dots and patterns... coupons and sales! We are getting ready to head out to get our family pictures taken as soon as the girls wake up from their naps. It's a gorgeous day! Warm and sunny- perfect picture weather. I bought this dress at Old Navy a few weeks ago and I'm so excited to wear it today. I love how bright it is and how bright this necklace is, too. 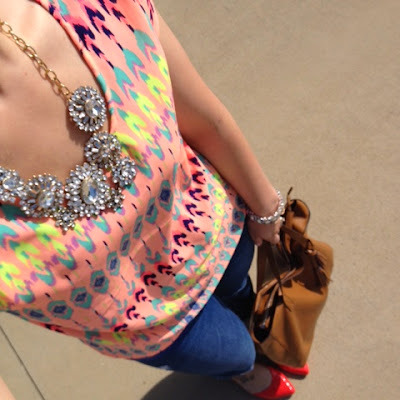 The necklace is what I centered all of our outfits around. The girls are wearing purple and pink dresses and Josh is wearing two shades of blue with green and pink stripes in his shirt. We are going to be colorful and bright! Enjoy your Sunday! 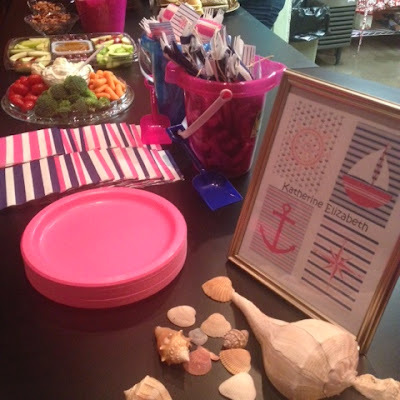 Yesterday I hosted a nautical themed baby shower for my good friend and boss, Pam. 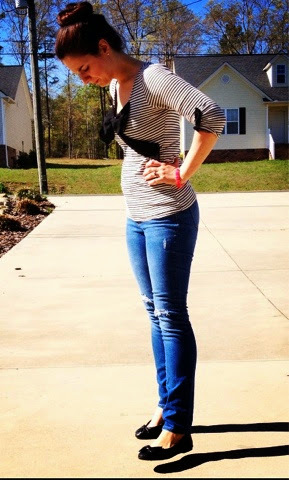 She is expecting her first child in June, a little baby girl that she will be naming Katherine Elizabeth. I am so excited for her and the exciting journey of motherhood that is upon her. Being a mother is one of the most challenging but greatest experiences of my life and I love watching my friends become mothers. The shower turned out beautifully and Pam was showered with lots of love from family and friends. The lighting wasn't great so my pictures didn't come out as clearly as I had hoped but I wanted to share some of the fun details that went into this shower. Thanks to Pinterest and my own imagination, it turned out exactly as I had hoped. 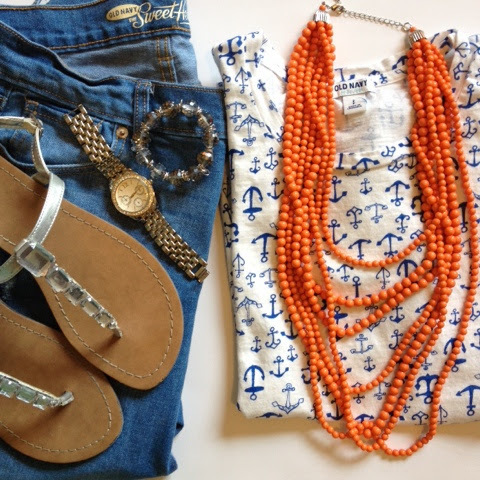 Anchors away! 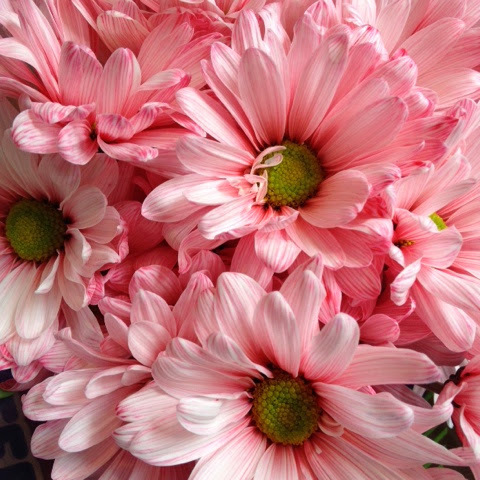 Pink daisies for the table centerpieces. 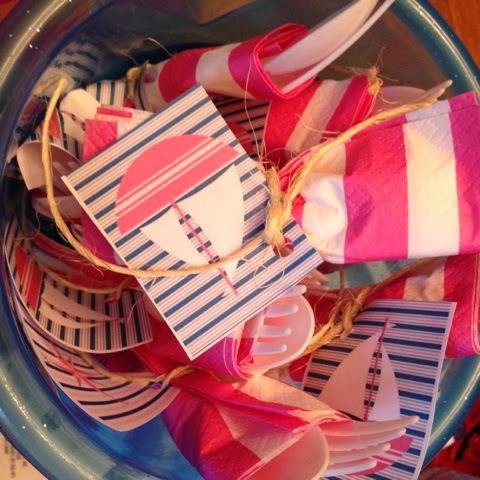 Utensils wrapped in striped napkins with twine and nautical tags stored in blue and pink sand buckets. Silly and sweet diapers for late night changes. 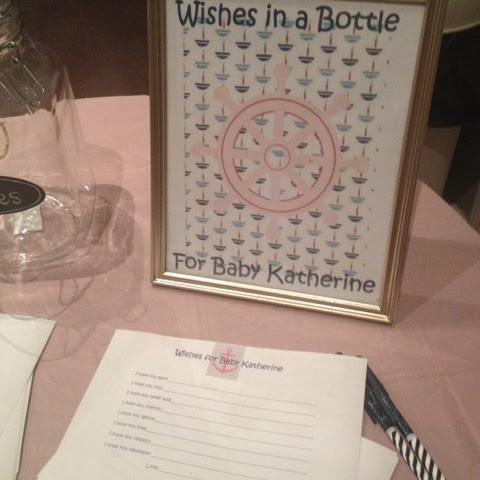 Wishes in a Bottle to share our wishes for Baby Katherine. 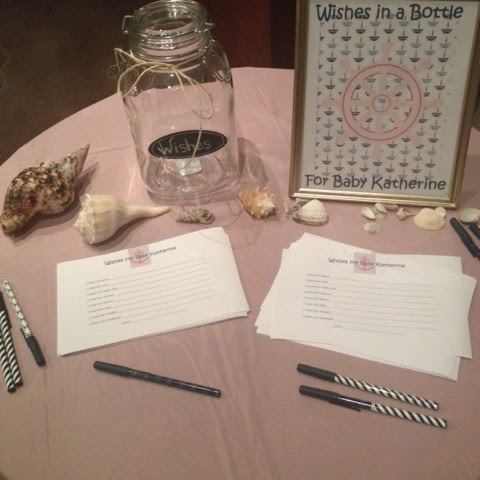 The guests filled out the sheet and then put it inside of the wishes jar for Pam to read to Katherine when she's older. 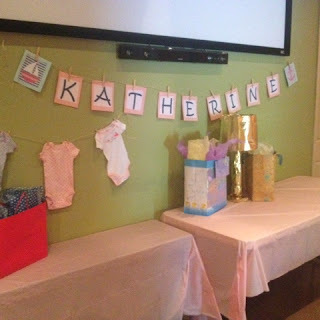 The name banner and hanging onsies. 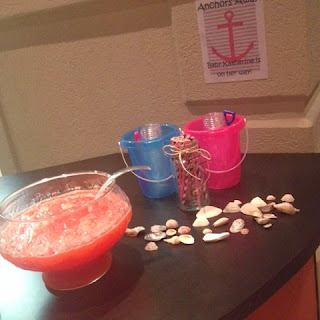 I was thrilled to find a pink onsie with blue anchors that fit the decor perfectly. 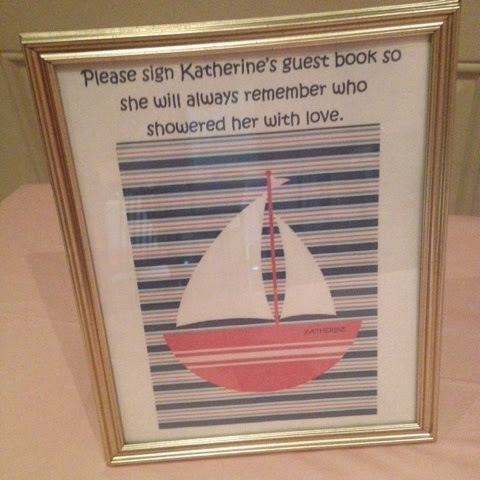 The guest book table. 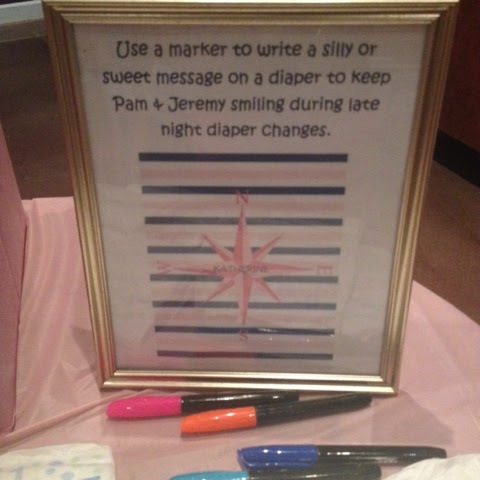 Guests signed the inside cover of "On the Night You Were Born" as a guest book for the shower. The centerpieces on each table. 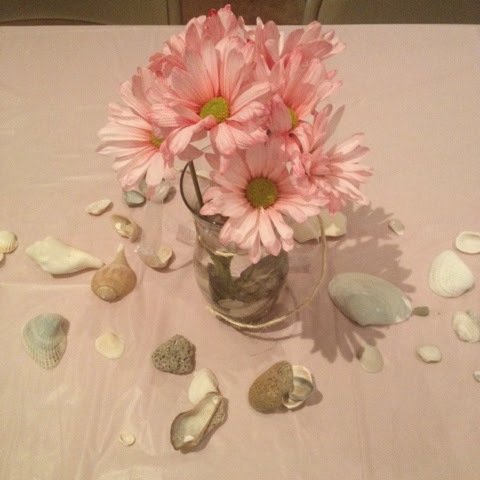 A vase of pink daisies with seashells in the bottom. 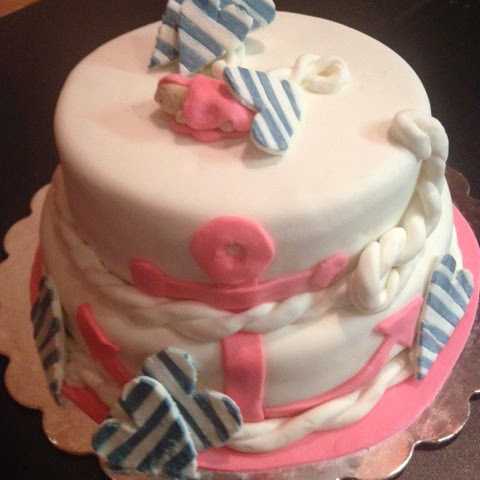 Adorned with sheer pink ribbon and twine. 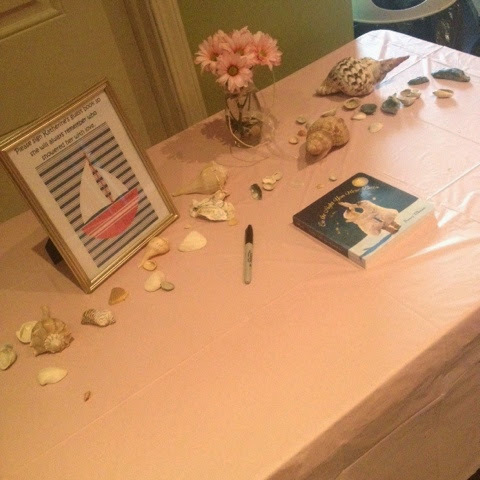 Seashells were also scattered on each table. The beautiful cake that was made by a friend at church. I loved how it turned out. She's so talented! The food layout. We served chicken salad sandwiches, homemade bread, cake, veggies, fruit, pretzels, Goldfish, nuts, mints, and punch. It was all so delicious! It's baby shower day! I'm so excited to be hosting a nautical themed shower for a very loved baby girl today. I bought this dress for Easter but I ended up not being able to wear it since I was singing at church. But it's perfect for today's shower. The colors are pink and blue with lots of stripes. 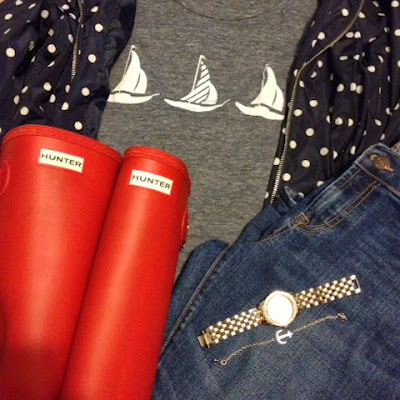 The anchor bracelet adds a nice nautical touch. I hope everyone has a fun filled Saturday! I haven't had to buy mascara in a few months because I received some for free in my Influenster box. I needed some new mascara last week so I just grabbed something inexpensive while I was at Target. Mistake. It was terrible. 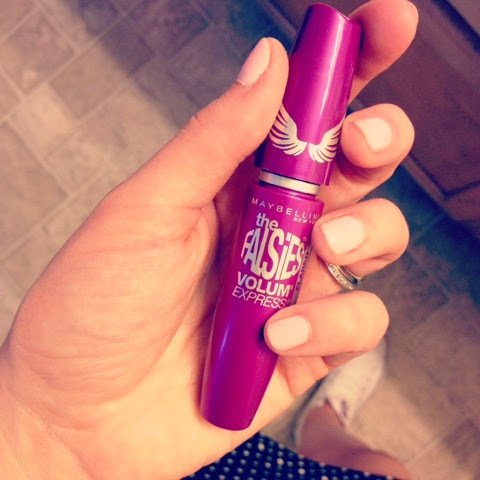 The wand was small, the mascara seemed dry, and it did nothing for my lashes. So I went back to my old faithful, Maybelline Falsies in very black. It's the best drugstore mascara and it's about $6. I should have just went with what I love instead of trying to be cheap and get a $3 mascara that I had never heard of it. I would definitely recommend Falsies to anyone! Full lashes here I come. Ain't nobody got time for that. Josh bought me this t-shirt for Mother's Day last year because it's been my favorite saying since the You Tube video went viral. I find myself saying it all the time and I drive Josh nuts saying it. This is still one of my favorite t-shirts and it always makes someone laugh when they see me in it. Comfy tee and laughs. That's a good combination. I guess I've got time for that. Happy Friday! It's been a good week here. Busy but good. 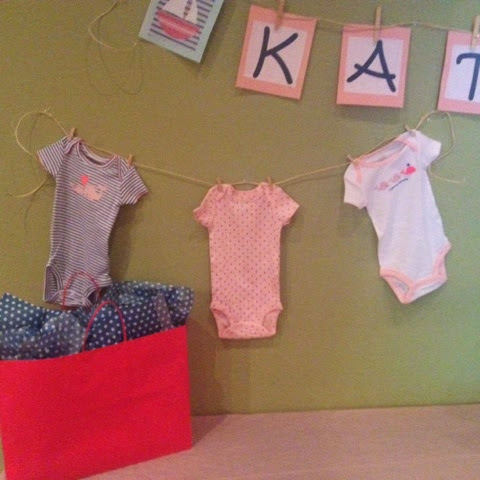 I have been busy baby shower prepping and I am so excited to put it all together. 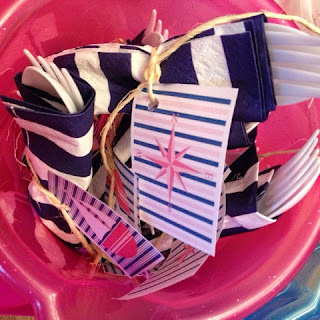 It's a nautical themed baby shower for my friend/boss and her upcoming baby girl. I can't wait to share of all of the details of the shower. It's going to be a busy weekend! Now it's time for your weekly dose of Friday Favorites. I own the shoes and love them. They are a little brighter and more neon in person. They are so comfortable and cute so I would definitely recommend them. Everything else is wishlist items that including pearls, floral, and more bright colors. I love the shorts but they are sold out so I linked a similar pair that I love equally. Check out the links for more information and to purchase these goodies for yourself. This shirt. Isn't it pretty!? 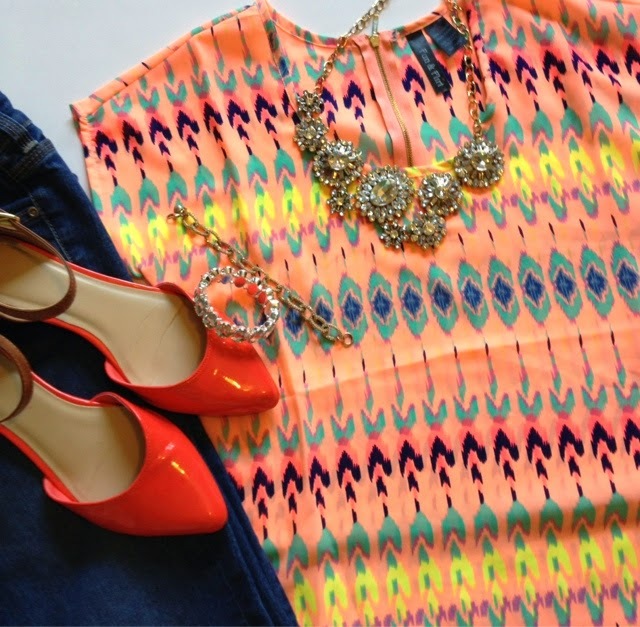 I've been drawn to bright, neon colors lately. They are just so fun and cheery. 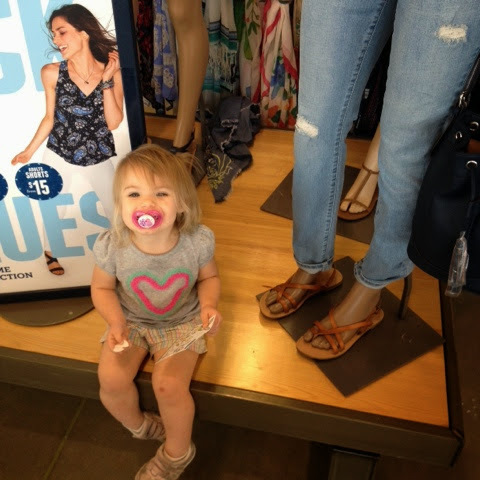 Olivia and I did some shopping yesterday while Julianna was at preschool. We strolled through Marshalls and this top caught my eye. At only $12.99, it came home with me. The colors are just beautiful and the fit is perfect. It compliments this gorgeous day just perfectly. Have a happy Friday Eve! 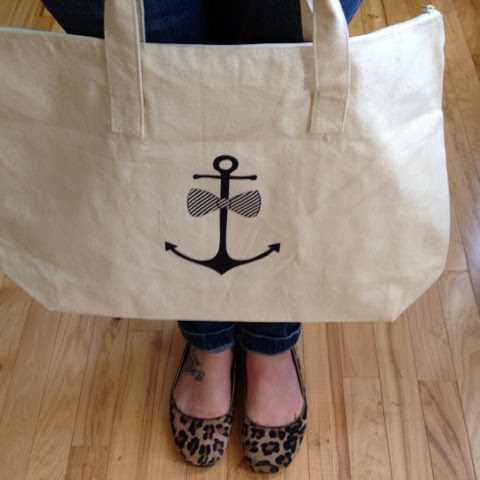 Isn't this tote adorable?! It's also by the talented Katie at SaSea Decor. 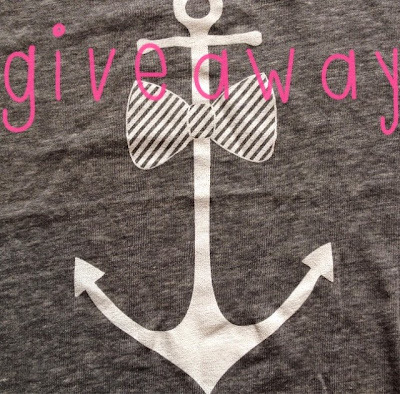 I am teaming up with her for a giveaway for a $25 gift certificate to her Etsy shop! Check out this post for more information and to enter! Running errands is much more fun in a shirt with neon pink bicycles on it. This shirt is so comfy and you know what my favorite part about this shirt is? Sure, I love the print but my favorite thing is the fact that it never has to be ironed. It looks great even after sitting in my "to fold" laundry basket for four days. 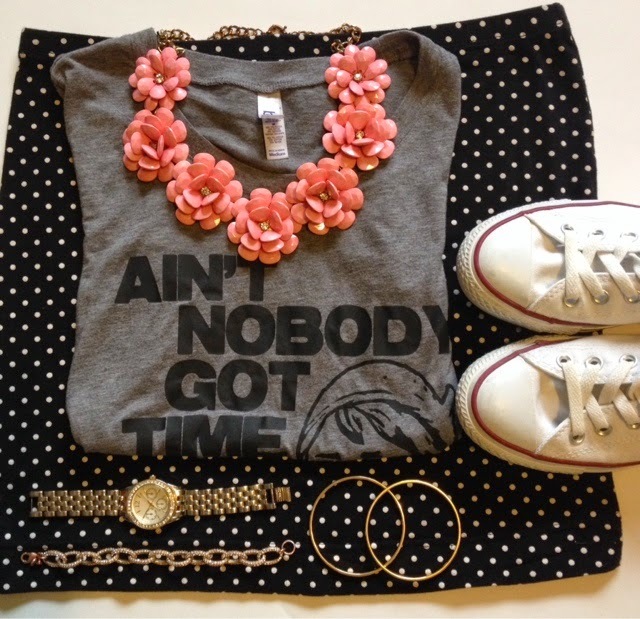 This shirt is a busy mom's best friend. Me and ironing aren't really friends. I avoid ironing at all costs. So a shirt that doesn't need to be ironed is amazing. Happy Wednesday! 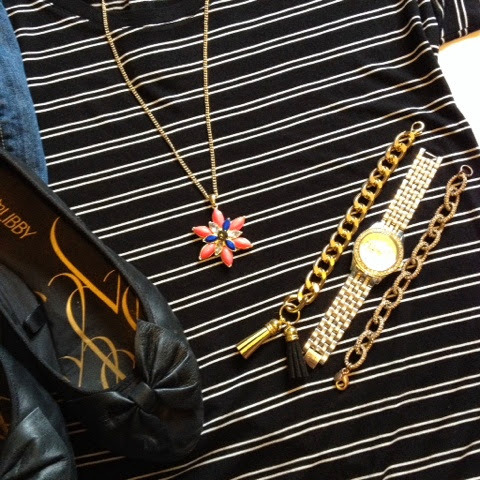 Below you will find a picture of my planned outfit all laid out nicely. Fact: I did not wear this outfit in all of it's parts at one time today. I had planned to but changed out the sandals for Toms for play date at the zoo this morning. At the zoo, we had a blast. Played with friends and in the water/dirt. Somehow I ended up with dirt all over this shirt by the end of our adventure. I changed shirts and ended up back in these sandals for work this afternoon. Outfits and mommyhood don't always mix but we had a great day. Mommy life isn't always glamorous and today was an example of that. I had a $6 gift on the Wrapp app for H&M. Since I was close to the mall running errands this morning, I decided to go ahead and use it. 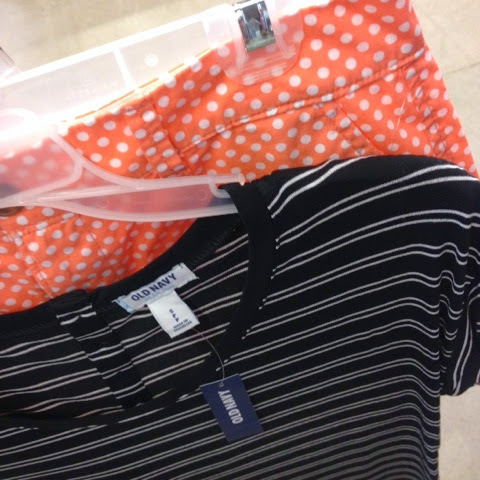 I got two items there for less than $5 and then we were headed to Forever 21. We had to go down the escalator to get there and this isn't usually a problem for Julianna. I was holding Olivia when Julianna stepped on. As soon as she stepped on, she tripped and fell down. Such a scary mommy moment. She cut her knee but otherwise was thankfully ok. We headed to the security office because I figured they had a first aid kit available. We got her all cleaned up and then went to Forever 21. All was well in there until I had to sit Olivia down to get my wallet out. In a matter of 3 seconds, she opens up a bottle of neon orange nail polish and makes an artistic mess. The good news is Julianna is ok and Olivia is now a nice shade of orange. 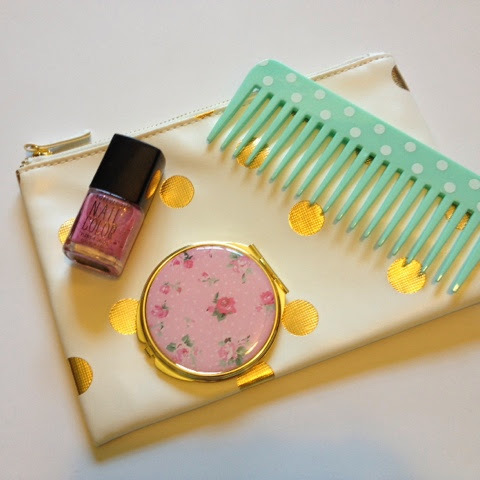 Oh and I did make it out of there with some new pretty things. I got the makeup bag to organize my purse. Yesterday at church I realized I didn't have any sort of compact or brush in my purse so I fixed that today, too. 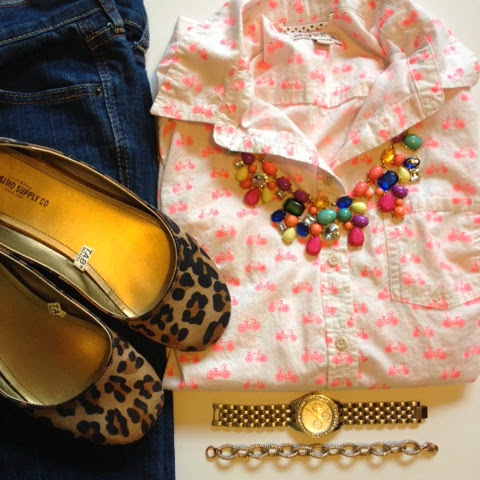 Oh mommyhood, you weren't glamorous today but these pretty things sure are. Happy Monday! Olivia (23 months) surprised Josh and I by counting to ten yesterday. Neither one of us even realized she knew how because it's not something we have been directly teaching her. But I think she's picked up on numbers from listening to our conversations with Julianna. It's crazy how much she just absorbs from her sister. Her vocabulary exploded around 18 months thanks to her interactions with Julianna and she's started potty training with many successes from watching Julianna all of the time. Big sisters are the best teachers. Gloomy Easter weekend weather. 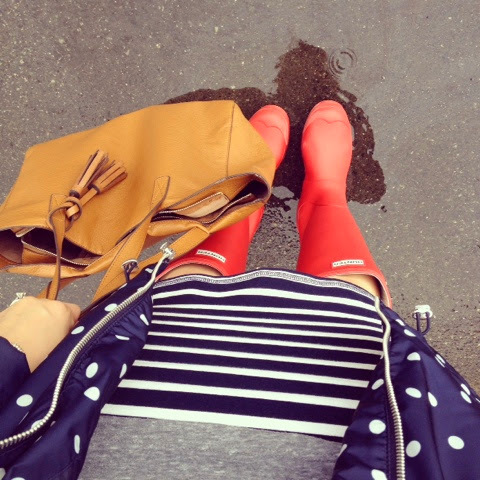 But at least I have my red rain boots to brighten up the day + this polka dot jacket. 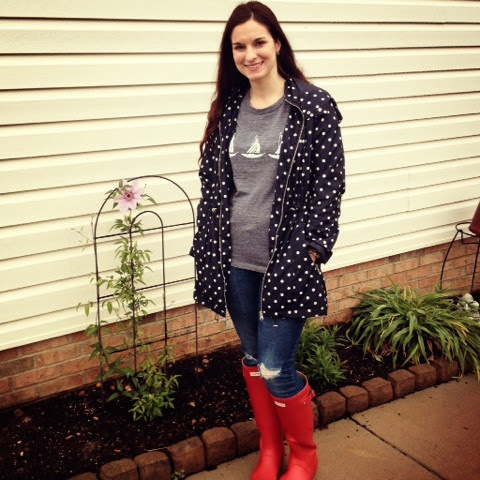 Check out that sailboat tee I'm wearing. Isn't it cute?! 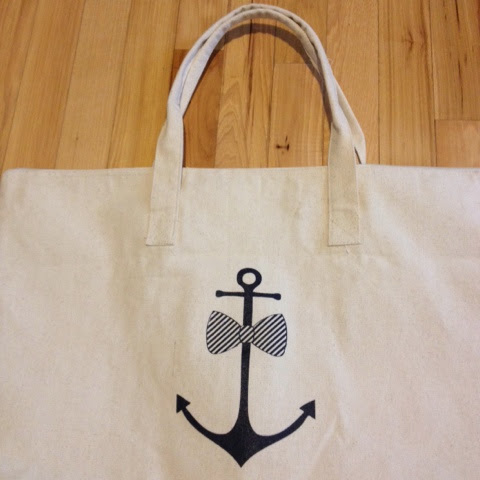 You could win one for free by entering my giveaway for a $25 gift certificate to SaSea Decor. Click the picture at the bottom of this post for a direct link to the giveaway. I am oh so excited to be hosting my first giveaway! 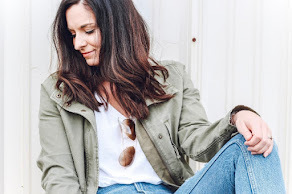 Katie, one of my very favorite Instagram friends, bloggers, and etsy shop owners has offered to give one of my blog readers a $25 gift certificate to her Etsy shop! Yay! 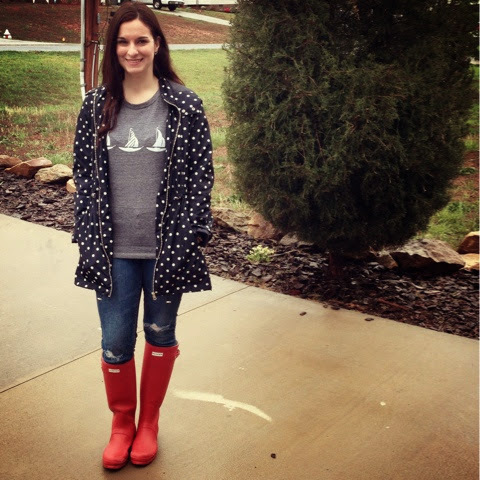 I absolutely love her Etsy shop, SaSea Decor and she has a fun blog, SaSea Living for you to follow, too. 1. 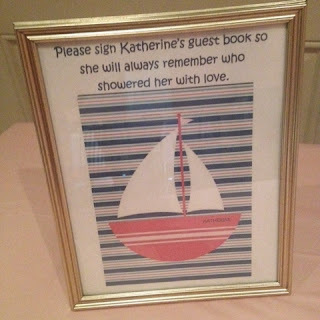 You must comment on this blog post by answering the following question: which item from Katie's Etsy shop, SaSea Decor, would you use the gift certificate towards? 2. Please include at least your first name and your e-mail address in your comment. 4. A winner will be chosen via a random number generator and will be announced on May 3. 5. All entries must be in by May 2 at 11:59 pm. 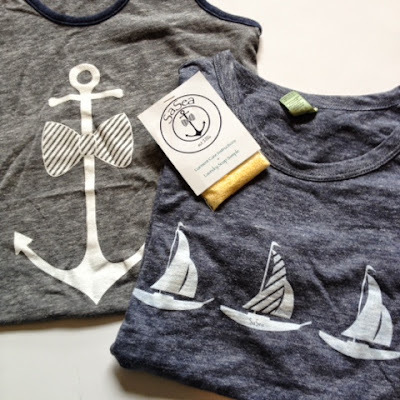 Above are two of the adorable shirts I received c/o of SaSea decor and they are the softest, most comfortable shirts I've ever owned. And who doesn't love the adorable nautical themed prints?! Don't forget to check out Katie's blog and follow us both! Find us on Instagram too- @emily_soto and @kcsnead. Thanks for entering! 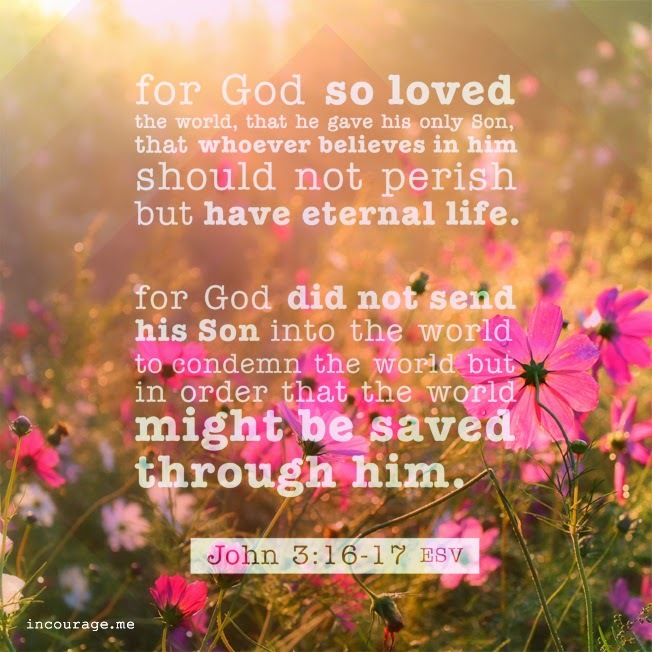 Today is Good Friday and before I share my Friday Favorites, I have to share a verse with you. Good Friday is the day that Jesus died on the cross for us. It's such an important day in history. The scripture below is one of my very favorite ones. Read it and reflect on it today. Thank You for the ultimate sacrifice. Our weather today isn't springlike again. It's overcast with cool temperatures. Tomorrow isn't looking pretty either. But I am still dreaming dresses, sandals, shorts, and floral print. Old Navy is currently have a great sale so the dress and bag even less than what I paid for them. I love a good sale! Oh spring, where are you today? It's just way too cold for spring. I may look warm in these pictures but I definitely wasn't! 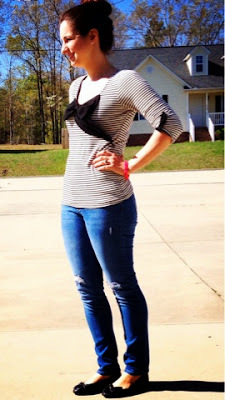 It was about 40 degrees but beautifully sunny and my cute little photographer took these pictures of me again. Isnt' she awesome?! I think so. This week is spring break for us so we have been squeezing in as many fun activities as possible. Zoo on Monday, frozen yogurt for dessert on Tuesday, and definitely indoor activities today. We went to Target and Old Navy- complete with popcorn and silly straws. Today has been a good day. It's been a rainy + stormy day in North Carolina. But today I was prepared. Rain jacket. 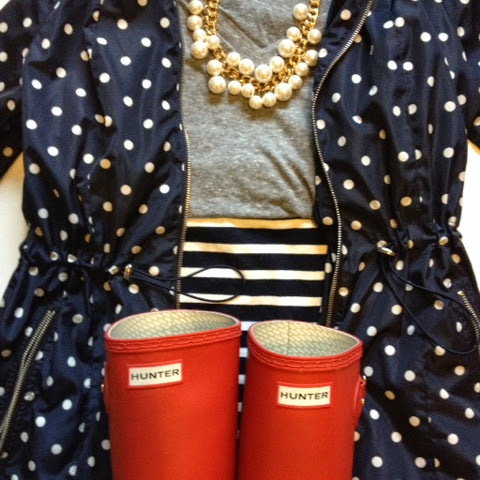 Hunter rain boots. Polka dots. Stripes. Pearls. All perfect ingredients to a rainy day ready look. I love how this outfit turned out and what's even better is that it was super comfortable, too. I wore this to my mom group that I lead on Tuesday mornings. We had such a great meeting and I learned so much. We are studying Tune In by Jen Hatmaker and it's been such a great experience so far. I would definitely recommend this book. Palazzo pants. 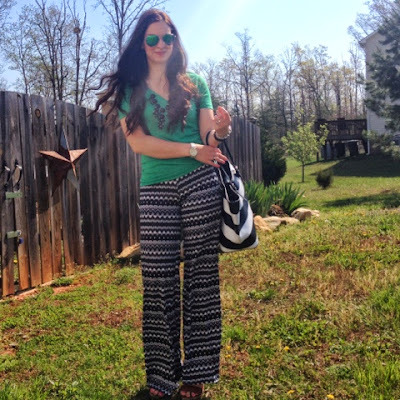 When I first saw this style of pants, I wasn't so sure that I couldn't pull them off. Every pair I saw had a very bold pattern. But they looked so comfy so I decided to give them a try. I ordered mine from Our World Boutique. As soon as I got them in the mail, I tried them on. They are so comfortable and feel like pajama pants! I was sold. 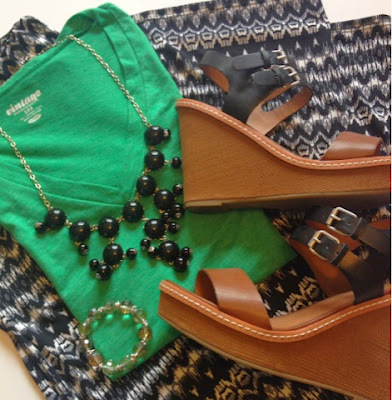 I love the boldness of them and how they can be dressed up with a pair of wedges. Such a fun pair of pants! 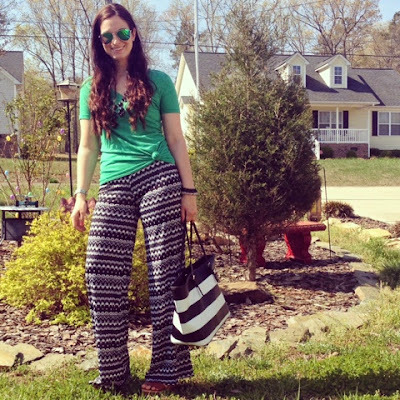 Palazzo pants for the win!